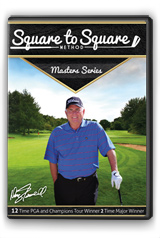 Square to Square Masters Series: This is where it all starts. 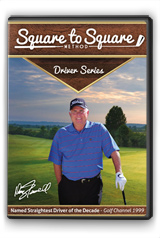 You and I will huddle together and break down the Square-to-Square swing into easy-to-learn segments, from grip and stance to follow-through and finish. Plus, I'll show my own secret tips for adding more distance and playing better in any situation. ItÃ¢ÂÂs the perfect swing for anyone who is having trouble with consistency and feeling those nagging aches and pains after every round. A must-have! Driver Training Series: There's a reason they named me Driver of the Decade. And inside this DVD, I'll show you EXACTLY how I got that title. You and I will go over every detail with your driver--from the biggest to the smallest--to help you hit those straight-as-a-string monster drives that settle in the short grass (and leave your buddies in awe). If you struggle with the big stick, you GOTTA see this one! 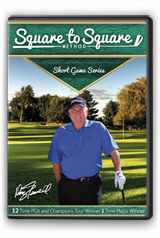 Short Game Mastery: YouÃ¢ÂÂll join me on the course for a full-blown series of lessons focusing on everything from 100 yards in. WeÃ¢ÂÂll talk strategyÃ¢ÂÂ¦ball positionÃ¢ÂÂ¦swing pathÃ¢ÂÂ¦mental approachÃ¢ÂÂ¦club selectionÃ¢ÂÂ¦the whole enchilada. WeÃ¢ÂÂll even dive into some specialty shots, like check-and-stop chipsÃ¢ÂÂ¦the ever popular flopÃ¢ÂÂ¦the dreaded half-wedgeÃ¢ÂÂ¦and more. Simply put, this is where you can make the biggest impact on your scores in the least possible time. DonÃ¢ÂÂt miss it! Perfect Putting: In my many years on the tour, IÃ¢ÂÂve seen as close to perfect as you can possibly get from a wide variety of hall of famers. And itÃ¢ÂÂs amazing what they have in common. So I decided to compile all this information and hand it to you inside this remarkable DVD training. WeÃ¢ÂÂll go over every aspect of a great putterÃ¢ÂÂfrom grip and stance to alignment, stroke path, and more. 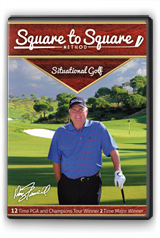 If your flat stick is leaving you frustrated, youÃ¢ÂÂve GOT to see this DVD! 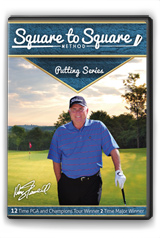 Drills Series and Secrets Series: we'll take the principles of our new Square-to-Square technique to the range, where I'll show you some simple, easy-to-learn steps to help groove your Square-to-Square swing and hone it to a fine edge. 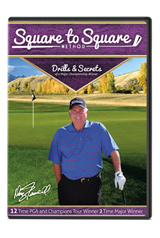 These are a few of my own personal drills that have helped me win over $10 million dollars on the pro tours, and I'll hand them to you inside this DVD. With this training in hand, you can soon find yourself hitting longer, straighter shots with skill and precision, leaving you with more birdie opportunities and less hacking out of trouble. Situational Golf: This is where the men are separated from the boys. With these tips, you'll approach any difficult situation on the golf course with a calm, relaxed manner, knowing EXACTLY how to get back on track (and back in the birdie zone). We'll cover driver missesÃ¢ÂÂ¦troublesome lies from both the rough and the fairwayÃ¢ÂÂ¦how to get out of virtually any harrowing predicament, and much more. Plus, I'll hand you some additional strategies to help get your head in the right place before you even hit your tee shot, so you can hopefully avoid these awkward circumstances altogether. A must for every golfer! 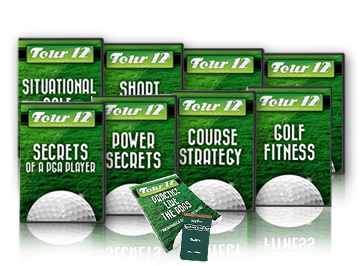 Tour 12 Private Lesson DVDs: This is over 8 hours of tour level training, the same type of instruction I give to students who hire me for personal clinics (and pay THOUSANDS more for it). WeÃ¢ÂÂll cover all the basics, and then crank things up even more with in-depth, detailed lessons on everything from mental approached to fitness to injury prevention. A must-have for any serious golfer over 40! 72 queries in 0.287 seconds.